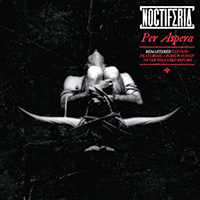 Noctiferia's 2002 album Per Aspera was re-released by On Parole productions in November, 2014. It comes with an added bonus of 3 demo tracks which were recorded in the year 2000 with the band's original vocalist. The band enjoys a cult status when it comes to the extreme metal scene in Slovenia. Per Aspera is a healthy mix of death and black metal accompanied by mean guitar riffs. It has fiery chunks of aggression combined with atmospheric melody which is elegantly executed.. The songs are well-structured and the vocals serve as a perfect match to the band’s playing style. The outstanding guitar work and its consistency on this album are a clear winner and deserve a special mention. It is also refreshing to listen to the raw, pre-production versions of Err To Hell, Aught Against Thee and Fond Of Lies which feature as the bonus tracks. This re-release is a welcome reminder of Noctiferia’s devastating power which they unleashed through their earlier work. With their musicianship they managed to create a splendid atmosphere on this album which calls for repeated listening. This is without a doubt one of their best works and a top notch Slovenian metal release.